This is the scene shortly after entering Cedar Bog via its fabled boardwalk. Most of the plant species in this shot are, if not downright rare, uncommon at best. Cedar Bog is a treasure trove of rarities; a botanical paradise quite unlike any other habitat in Ohio. I'm giving a presentation on the rare plants of Cedar Bog on Saturday, July 13 at 10 am in their fabulous new visitor's center. It costs a whopping $6.00 ($5.00) if you are a member of the Cedar Bog Association (and you should be!). Proceeds go to benefit the bog and its management, of course. All of the details ARE HERE. I've been visiting and studying the place for years, and will share photos of Cedar Bog's habitats and botanical denizens, as well as the story of its existence and why this habitat and its plants are so rare now, at least in Ohio. Perhaps best of all, following the talk we'll have lunch, then head out the back door and onto the boardwalk to see scores of interesting plants (and animals) in real time. I was at the bog yesterday morning, and spent some quality time ferreting out interesting flora with Cedar Bog's new manager, Tracy Bleim, and current Cedar Bog Association board vice-president Cheryl Erwin. Following is just a snippet of the cool stuff that we saw on our foray. A conspicuous beauty - and one you'll see if you make the July 13th gig - is the rare Fen Indian-plantain, Arnoglossum plantagineum. It's having an especially good year and one might not think it rare if Cedar Bog was their only exposure to this plant. But it's only known from a handful of other sites in Ohio. Grass-pink orchid, Calopogon tuberosus, which is also in profusion at Cedar Bog this year. It is one of ten species of orchids here - 22% of Ohio's total orchid flora. Not bad for a 427-acre wetland! Cedar Bog is not really a bog - we'll learn more about wetland terminology on the 13th - but is a fen. And fens are dominated by sedges, some of which are showy and quite interesting. This is Twig-rush, Cladium mariscoides, which is rare in Ohio, but not at Cedar Bog. Its only close relative in the eastern U.S. is the saw-grass of the Florida Everglades. A beautiful flower to be sure, but don't eat it! This is the "Death Camas", or Wand Lily, Zigadenus elegans, and it is toxic. One of my target plants was one of Ohio's great botanical rarities, and a species I probably hadn't seen for a decade or more. We were a bit past its flowering time, but I found that the fruit, with their long feathery bristles, looked quite fine. This is a state-endangered plant, the Prairie Valerian, Valeriana ciliata, and it is only known from one other locale in Ohio. This is arguably Cedar Bog's most significant plant. In 1838, botanist John Samples discovered Prairie Valerian at Cedar Bog, and it was described to science from his specimen. Of course, tremendous plant diversity spawns animal diversity, and one cannot stroll Cedar Bog's boardwalk without encountering interesting animal life. This nymph katydid had the temerity to snack on the flowers of Shrubby Cinquefoil, Dasiphora fruticosa, which is a fairly rare plant in its own right. We were pleased to see several Appalachian Browns, and one of these butterflies cooperated quite nicely for our cameras. There is a lot of butterfly diversity at Cedar Bog, including our largest species, the Giant Swallowtail. This is the state-endangered Elfin Skimmer, the smallest dragonfly in North America. As always, CLICK THE PIC to see more detail. This is the male, in his chalky-blue finery. Females are just as small, but look totally different. They are wasp mimics, with alternating bands of black and yellowish-white, and even twitch their abdomen like a wasp when at rest. I can about guarantee that we'll see these, and other cool dragonflies on the 13th. Even the parking lot has its charms. Native plants abound around its edges, and I wandered over to check some blooming Common Milkweeds, Asclepias syriaca. And then spent the next ten minutes capturing images of the charismatic Red Milkweed Beetles, Tetraopes tetraophthalmus, that were inhabiting the plants. If you've never visited Cedar Bog, I hope that you can make it out on July 13th. And if you have, I hope that you can come again! For the first time in a long time, I ran a Breeding Bird Survey route. BBS birding is intense. The surveyor must begin at sunrise (my starting time was 5:32 am), and drive a 25 mile route, stopping for precisely three minutes every half mile. During the three minute stop, the observer is to record all birds seen and heard, and that can be a challenge, especially when the dawn chorus is in full swing. It's great practice, and makes one really look and listen, oftentimes in places and habitats that might not normally be visited. 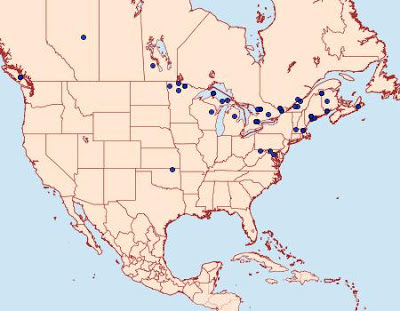 The data contributes to a massive pool - BBS surveys have been ongoing since 1966, and provide an excellent barometer of the health of North America's breeding birds. My route extends on a north-south trajectory through rural Hardin County, ending at the massive Findlay Reservoir in Hancock County. I made the run last Friday, and tallied about 71 species - not bad for farm country. This rural run reinforced how Vesper Sparrows thrive in highly agricultural landscapes, and how many Red-headed Woodpeckers live in open country interspersed with woodlots. One stop was at a small cemetery, and upon hopping from the car, I heard the excited chatters of a pair of Carolina Wrens in some dense brush. Glancing over, I noticed the luxuriant growth of some sort of ornamental geranium spilling from a pot hung between two headstones. I figured that's where the wren's nest was, and kept one eye peeled while tallying other birds. Sure enough, it wasn't long before one of the wrens slipped from the brush, and popped into the flowerpot. Carolina Wrens love to nest in flowerpots such as this. If you've got 'em around, hang a few pots on the porch or wherever, and there's a good chance your geranium basket will grow birds in addition to plants. The Bewick's Wren also likes hanging baskets. One of the last known Ohio nests of this species, which is now likely extirpated here, was found in the early 1990's in Pike County by Dave Minney. Those birds, which I saw, were nesting in a pot pretty much just like the one in my photo. It hung from a rail on a country home's porch, and I think that the house's human inhabitants didn't really understand the hubbub the little birds created among birders, who stood around staring at their geranium pot for extended periods. Nonetheless, the homeowners were gracious hosts and endured the ogling of their wrens by birdwatchers. Anyway, I had to take a slight break from the rigid three minute stop interval, and tack on a bit of time to snap a quick photo of the nest. There were at least four young wrens in the flowerpot, although I'm not sure of the exact number. I didn't spend much time looking, and didn't want to disturb the nest. Peeking through gaps in the foliage revealed a fuzzy little scrum of infant wrens, downy plumage still obvious but the telltale bold white eyeline already clearly visible. By now, these baby wrens are probably out and about, and hopefully they didn't suffer too many unwelcome waterings by whoever tends that flowerpot. This book could be the death of me, I'll tell you. Now, finally, we've got a great guide to the moths (or many of them), featuring excellent full color photos. 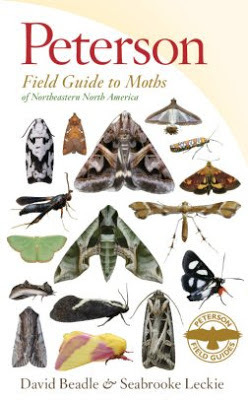 It's fun (for me) to page through looking at all of the neat moths that fill the pages. To be honest, most of my paging occurs when I'm trying to identify something, and have to flip through nearly every page on the book before making a match. Do that enough times, and you'll get somewhat acquainted with the guide's subjects. Sometimes, one of the moths jumps from the page and really grabs my eye. For some reason, the species at the bottom of page 147 did just that: Biden's Grass-Veneer, Crambus bidens. The grass-veneers are mostly small and undistinguished, and some are regular visitors to nightlights. I get them on my porch, occasionally. But this veneer was different. It was splashy in a quite unveneerlike way, and I instantly wanted to see one. Saturday, June 22, 2013 found me in Brown's Lake Bog, Wayne County, ostensibly to photograph blooming Rose Pogonia orchids, Pogonia ophioglossoides, but of course I was attempting to look at everything and anything. Suddenly out popped a little white and brown moth that had been lurking on the underside of a blueberry leaf until I clumsily bumbled into the plant. The moth shot off, me in pursuit, and when it alit - Bingo! I was treated to my first Biden's Grass-Veneer! A beautiful animal indeed, as I'm sure you'll agree. A bit goofy, perhaps, with that long furry snout and tubular body, but among the veneers, this one gets the tiara. The juxtaposition and patterning of the rufous-brown and show-white is nothing less than stunning. In Ohio, bogs are rare indeed, and I view all bog-inhabiting organisms with suspicion. Rare habitats support rare organisms, and when I see something that I don't know anything about in such a place, I want to know more. In the case of the Biden's Grass-Veneer, I quickly hit a brick wall in my quest for knowledge. The map above is from the Moth Photographer's Group, which is probably the best and most comprehensive resource for moths on the Internet. Their map shows no Ohio record. But I do take that with a grain of salt, as gleaning every record of all moths in each state is a tall order indeed. I have a list of some 2,000+ species of moths collected in Ohio that was given to me by a professional entomologist, and Biden's Grass-Veneer appears on this roster. But only its name - no other info at all. According to the aforementioned book and a few other reliable sources, Biden's Grass-Veneer is a denizen of bogs, but all of these sources list the host plant as "unknown". Most species of grass-veneers eat, duh, grass, as the name would imply. However, grass (of any species) is a fairly scarce commodity in a sphagnum bog such as Brown's Lake Bog, where I found this beast. My hunch is that the Biden's Grass-Veneer's caterpillars do not feed on grasses, but instead snack on some type of bog specialist plant. I also wonder what this moth's true status in Ohio is. If it truly is confined to peat bogs, it ain't going to be common, because bogs are in short supply. If anyone can shed any light on the mysteries of the Biden's Grass-Veneer, please let me know. Your narrator (R) and Mr. Big Year, Greg Miller, flank Marcia Rubin in front of the sign that informs readers about the Bobolink Mecca in the backdrop. I was in Ashland County last Saturday to participate in the 8th annual Bobolinks at Byers Woods event. We three were a wee part of the some 120 attendees that converged on this 130-acre Ashland County Park District holding to celebrate that most interesting of blackbirds, the Bobolink. This park has an interesting history, full of the flotsam and jetsam of north-central Ohio society. The majority of Byers Woods - in spite of the silviculturally based name - is an old landfill. It's capped, grassed over, and sprouts methane vent tubes. And Bobolinks, along with other grassland breeding birds, love the place. I first saw the area 16 years ago, before it was a park. Along with Louise Fleming from Greater Mohican Audubon Society, I toured the freshly sealed landfill with a couple of the county park guys and we discussed possible environmentally friendly goals for the site. Sam Weyrick and the others with Ashland County were keen on making the best of the landfill, Greater Mohican Audubon Society (GMAS) ramped up their efforts to help, and the rest is history. Thanks in large measure to the current GMAS president, Cheryl Harner, Bobolinks at Byers Woods was hatched in 2006. A major focus of the event was to draw attention to the nesting ecology of Bobolinks and other grassland nesters, and stir interest in Byers Woods as a park and bird conservation area. They've succeeded. Because of the educational outreach of this event, land managers have delayed mowing until late in the year, well after all of the grassland breeding birds have fledged their young. A simple shift in mowing regimes seems like an easy thing to accomplish, but that's not always the case. A major threat to Bobolinks and other meadow-dwellers is early mowings that destroy nests and young birds. Quite an assemblage of vendors and non-profits attend, and set their tents along the vast meadows of the former landfill. Browsers of the displays are serenaded nonstop by the rich bubbly R2-D2 gurgles of displaying Bobolinks on the other side of the fence. Robert Hershberger of Time & Optics occupied the first tent, and people testing his scopes and binoculars could train them on Bobolinks - not a bad focal point when testing new optical gear. A big part of Bobs at Byers is field trips. Here, a line of attendees snakes along the fence bordering the capped landfill, while brushland and woods extend off to the right. The bird list was impressive. In just this spot, we saw or heard species such as the oft-mentioned Bobolink, Savannah Sparrow, Eastern Bluebird, Eastern Kingbird, Yellow-billed Cuckoo, Yellow-breasted Chat, Yellow Warbler, Orchard Oriole, Field Sparrow, Red-tailed Hawk, Eastern Meadowlark, Willow Flycatcher, Northern Flicker, Yellow-throated Vireo, Gray Catbird, and more. In all, I tallied at least 63 species - not bad for an old landfill and its immediate environs! This is the vista that visitors see when strolling the trails at Byers Woods. The only real giveaway that this gently rolling hill was once an active landfill are the white vent tubes here and there. As I understand it, in 14 years both the tubes and the perimeter fence can be removed. Then, one would never know the site's trashy history if not told. I was basically afield and leading groups from 9 am until 1 pm, and when so engaged I tend to take few if any photos. As the event wound down, I realized that I hadn't even bothered to snap a shot of a Bobolink - sacrilegious indeed! So off I trotted with my little Panasonic point & shoot, and within minutes sighted and snapped a "Bobo" on a fence rail. You just can't miss 'em. Cheryl estimated that about 50 males occupy the grasslands this year, more than in year's past. Our first group out, which I co-led along with uber-birder Kathy Mock. We had a great time and saw lots of stuff - so much stuff, in fact, that I forgot I was supposed to be back at ground zero to head out with another group at 11 am. Oops! No problem, thanks to a convenient lift on a golf cart, I was only slightly tardy. Anyway, everyone looks pretty happy in this group shot. I'd like to think they'd be happy no matter what, but everyone was especially elated due to a most obliging Black-billed Cuckoo that came in and posed at close range for extended viewing. Everyone in this group saw the bird, and it was a lifer for most. Our second excursion focused on insects, and I was pleased to be a co-leader with Cheryl Harner and Lisa Rainsong. Our investigations of the grasslands and wetlands produced many interesting bugs, including several butterfly species including a fly-by Milbert's Tortoiseshell, and two highly cooperative bumblebee mimic robberflys. Not to mention numerous dragonflies, including this stunning female Eastern Pondhawk. A juvenile Tree Swallow peers from its lair. The numbers and diversity of birds that are produced on this former landfill site is amazing, and Bobolinks at Byers Woods has done an impressive job of showcasing alternate, truly green uses for abandoned landfills. We people leave an incredible amount of rubbish in our wake, and giant landfills are a necessary evil. I think there can be no higher repurposing of a landfill than to grow Bobolinks and other birds on the abandoned spoils of our throwaway waste. A good irony, indeed. Watch for Bobolinks at Byers Woods next year when June rolls around, and plan to attend. 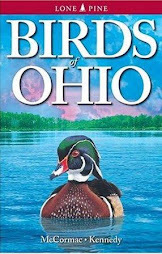 Also, visit Cheryl's blog RIGHT HERE and read her recap of the event - she is thorough in acknowledging all of the players that made Bobos at Byers possible, and it's this team that brought about the conservation of what may be Ohio's birdiest landfill. Yesterday was a great day, with lots of field time. It all started with "Bobolinks at Byer's Woods" in Ashland County. 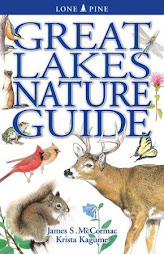 This event is organized by Greater Mohican Audubon Society, and has been running for six or eight years. I've got some interesting photos from that and will share some later, along with the story of the festival. 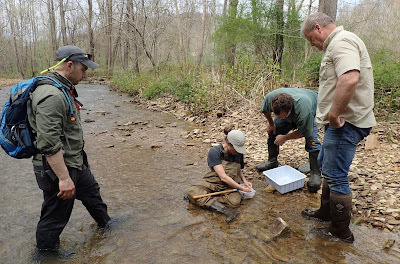 Following the conclusion of Bobs at Byer's, it was off to do some fieldwork at Mohican State Forest and Brown's Lake Bog, where I had specific target animals and plants in mind. We saw lots of stuff, and I made many a photograph of course, including images of some of our rarer orchids. It was a HOT day, with temperatures soaring to 89 degrees and accompanied by high humidity. After a solid nine or ten hours out, it felt good to stay indoors today and catch up on myriad tasks. As always happens when afield, other interesting species popped up. While exploring a trail along a small stream deep within Mohican State Forest, Marcia Rubin spotted a youngish Northern Watersnake, Nerodia sipedon, basking in a sapling while I was prostrate and photographing a Round-leaved Orchid, Platanthera orbiculatus, in full bloom. Of course, I wanted to photograph the snake, too, and sprang to my feet to admire the animal. It was in a particularly nice backdrop, and was acting fairly tame, which allowed for some up close images. In addition to capturing some decent photos of an animal that is often found in more cluttered backdrops, I saw an opportunity to explore the camera's depth of field variances. Note how I am giving you snake-dislikers plenty of time to escape :-) Snakes lend themselves well to exploiting depth of field comparisons with cameras, as we shall see. The following two photos should be instructive. The watersnake was nice and cooperative in that it was posing about head high. That it was resting on a branch made for, I think, a more interesting pose than if it were on a rock in a stream or a muddy bank. Fortunately for me, I had my tripod along. I rarely use it when going afield for photos, because it is cumbersome and photography is normally only part of my goal - covering ground and locating as much interesting flora and fauna as possible is a big part of my forays. And normally, by using other stabilization methods and photography techniques, I can do fairly well sans tripod. But the target of this trip was the Round-leaved Orchid, and I knew it would be growing in a situation with very poor light. Hence, the tripod was lugged along. So, when the snake came to light, I was able to set the camera rig up quickly a few feet out from the animal. This was in a heavily forested situation with poor light, and I wouldn't have been able to get decently crisp images of the snake - or orchid - by handholding the camera. Since I had the stability of a tripod, very slow shutter speeds could be used, especially as there was no wind or movement of the subject. Even though the camera will deal well with much higher ISO settings, which allow for faster shutter speeds, I wanted to keep the ISO low for maximum image quality. Note how the snake's face is crisp ( as always, click on the photo to enlarge) but the animal's body quickly diffuses into blurriness. Because of the much greater depth of field produced by the greatly stopped down aperture, we can now see the snake's body in far greater detail, and this shot, to me, is vastly improved over the first image. But without benefit of a tripod, there would have been no possible way to make the image at such a ridiculously slow shutter speed. Any movement of the subject would have ruined the shot as well. Anyway, I wanted to share a few more photos from Mothapalooza, and give some richly deserved thanks to people and organizations that made it possible. Looking a bit like a chunk of stratified bedrock, this Common Lytrosis, Lytrosis unitaria, was a regular visitor to the sheets. By the way, when I say "sheets", I mean specially deployed white sheets or drop cloths hung in strategic areas, and brightly lit with lights. Sheets illuminated in this manner are irresistible for many species of moths, who fly in and land on the sheets, affording us the opportunity to study and photograph them at close range. Much smaller but far more colorful than the Common Lytrosis was this Painted Lichen Moth, Hypoprepia fucosa. Many moths, including lots of the tiny species, are veritable rainbows with wings - among our most ornately patterned flying animals. Setting out a sheet or sheets is a bit like fishing. You never know what might come in, and the cast of characters is constantly changing. This was the first time that nearly everyone at Mothapalooza had laid eyes on this beautiful moth, at least as an adult. Some of us had seen the gorgeous caterpillars, though - CLICK HERE for those. David and Laura Hughes had collected some livestock (caterpillars) of this flower moth in the genus Schinia last year, and successfully reared a few of them to maturity. This moth is the result. They were kind enough to bring along the newly emerged animal so that the Mothapalooza crowd could see it, and we could make photos. Insofar as I know, this newly discovered species has not yet been formally described and named, although it soon will be. Lots of caterpillars were found, and in some respects the larvae of moths and butterflies are more interesting than the adults. If we do put on Mothapalooza II, we'll probably add a talk or two about caterpillars, and perhaps some field trips that emphasize finding them. This is the caterpillar of the White-dotted Prominent moth, Nadata gibbosa. Someone threatened the caterpillar by giving it a gentle tap, which caused it to go into defense mode. When alarmed, this caterpillar instantly twists into a snakelike coil, and bares its mandibles, creating a rather scary face. This act might be adequate to ward off some of the smaller would-be predators. Mothapalooza was fortunate to have the services of some of the top entomologists in the country, and these guys don't miss anything. Lepidopterists - moth and butterfly specialists - become proficient botanists, too, as knowing the host plants that caterpillars feed upon is a huge asset when seeking out larvae in the field. I was with Jaret Daniels doing some pre-conference scouting when he found this caterpillar, which is snacking on the emerging buds of Black Cohosh, Actaea racemosa. It is the larva of the Appalachian Blue butterfly, and the cat's coloration matches the plant nearly to perfection. If one did not know to check the cohosh, there would be little or no chance of finding this caterpillar. The ant standing atop the caterpillar is essentially protecting it. Appalachian Blue caterpillars are nearly always tended by ants, who are adept at fending off insect predators such as parasitoid wasps. The ants. in turn, receive nutritious honeydew secretions from the caterpillars. One of our group afield along a remote forest road, finding and showing people Appalachian Azure caterpillars. Not far from here is an incredible gravelly pullout with damp soil that attracts scores of butterflies. We had over 20 species at once at this place on our days field trips. Of course, with 150 sets of eyes afield, and many of them highly trained eyes, lots of interesting organisms will come to light. This is an Eyed Click Beetle, Alaus oculatus. It looks fierce, but those giant eyes are a ruse. The fake eyespots create an intimidating look, though, and it might be enough to dissuade predators from messing with the beetle. I have never seen so many cameras at an event, or at least such a high ratio of cameras to attendees. I think 95% of the people at Mothapalooza had a camera. Indeed, it is in part the revolution of inexpensive high-quality digital cameras that have created the boom in popularity of moths. These insects are highly photogenic, and shooting their images is part of the allure. Here, Derek Hennen photographs a Harvester butterfly, Feniseca tarquinius, which is really little more than a glorified moth (moths and butterflies are essentially the same thing). Derek also demonstrates a critical photo technique when going after bugs - get down on the level of your subject. An added perk of holding Mothapalooza at Shawnee State Forest and the nearby Edge of Appalachia Preserve is the legion of native plants that are found in these areas. There are over 1,000 species of native plants, which is why the moth and butterfly diversity is so extraordinary. Many rare or uncommon plants occur, and our group was pleased to encounter this interesting lily in full flower, the Devil's-bit, Chamelirium luteum. At least four species of milkweeds were at peak bloom, and none are more colorful than this Purple Milkweed, Asclepias purpurascens. A close look at the blossoms revealed scores of insects, including these tiny Buck's Plume Moths, Geina bucksi. A special treat was this Golden-banded Skipper, Autochton cellus, which is never a common find. In total, Mothapaloozians probably encountered about 50 species of butterflies, maybe even more. Moths? I don't know but the species count was way beyond the butterflies. Mary Ann Barnett is rounding up moth data from the experts, and when we get a tally I'll report it. Finally, huge thanks go to everyone who made Mothapalooza possible. 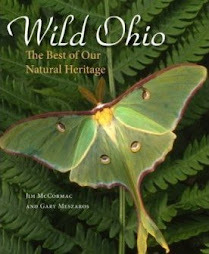 Our primary sponsors were the Ohio Division of Wildlife, which provided critical resources; the Midwest Native Plant Society; the Ohio Chapter of The Nature Conservancy; the Cincinnati Museum; and the Ohio Lepidopterists. Numerous individuals were vital to the event's success, not the least of which was Mary Ann Barnett, who handled oversight of the entire conference, and was absolutely stellar in this role and handling the myriad details. John Howard, who I have mentioned many times on this blog, was also key to developing and executing Mothapalooza. Others who were invaluable as planners, field trip leaders, speakers, or in some other important way included: Chris Bedel (Cincinnati Museum), Mark Berman (The Bug Guy), Diane Brooks, Jaret Daniels (University of Florida), Jim Davidson, Eric Eaton (principal author of the Kaufman Guide to Insects of North America), Andrew Gibson, Mike Gilligan, Roger Grossenbacher, Cheryl Harner, Dave and DeeAnne Helm, Derek Hennen, Dave Horn (past president of the Ohio Lepidopterists and a keynote speaker), Tina Howard, David and Laura Hughes, Ned Keller, Randy Lakes, Seabrooke Leckie (co-author of the Peterson Field Guide to Moths, the book that sparked an enormous upsurge of interest in moths), Janet Martin, Martin McAllister, Rich McCarty (The Nature Conservancy), Kathy McDonald, Dave McShaffrey, Dennis Profant (co-author of several moth books), Greg Raterman, Larry Rosche, Linda Romine, Judy Semroc, Rachel Shoop, Cindy Steffen, David Wagner (University of Connecticut, extraordinary lepidopterist and a keynote speaker), Pete Whan (The Nature Conservancy), and Mark Zloba (Cincinnati Museum). It's always risky business trying to acknowledge such a large cast, and I apologize profusely if I've omitted anyone. I also want to extends thanks to the excellent staff of the Shawnee Lodge for catering to us so well, and for their support of strange events such as Mothapalooza. Ditto that for Ohio State Parks. Lastly, a huge thanks to all of the Mothapalooza attendees. It was among the coolest crowds I've ever seen at a natural history conference, and we had people from at least ten different states and one Canadian province (Ontario). Some of the more distant travelers hailed from Connecticut, Colorado, Missouri, and Nebraska. It was great to see so many people keenly interested in moths, and it was a pleasure to introduce so many new people to the fabulous biodiversity of southern Ohio. I've got moths on my mind, and probably will for some time. The giant lepidopteran fest known as Mothapalooza will do that. We saw so many species in so many different groups of organisms at Mothapalooza that I could write about it and share photos for weeks, probably. But I'll not do that. Life goes on, and I'll soon be immersed in new adventures, and seeing new things. I do want to make two more posts about the Mothapaloozian weekend, though. This little charmer was a crowd pleaser, and we were lucky in that several of these outrageously fuzzy beasts appeared at the mothing sheets. It is the Black-waved Flannel Moth, Lagoa crispata, a well-named animal. The moth appears to be covered in flannel of the softest sort, and its sides are adorned with wavy black stripes. It reminds me of a tiny winged sheep. And check the antennae on this moth! It is a male, and I can only imagine its ability to sniff out female pheromones is magnificent. We also had some luck finding caterpillars at Mothapalooza, although I had to dip into my archives for this shot. It's the caterpillar of the Black-waved Flannel Moth, and although we didn't find one during the event, I made this shot two years ago very near one of our mothing stations. The caterpillar also has a certain charm to it, looking somewhat like a turtle covered in shag carpet. 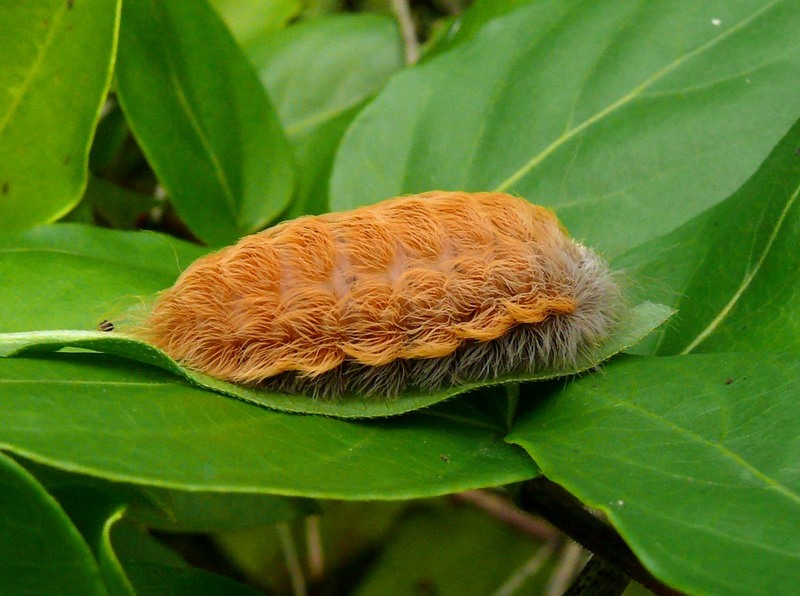 They aren't rare, and when afield during flannel moth caterpillar season, you'll want to take care as to where you put your hands. These caterpillars pack a brutal punch, being adorned with powerful stinging hairs. Touch one wrong, and you'll probably learn a painful lesson that won't soon be forgotten. Scroll between the caterpillar and the adult flannel moth, and there is some resemblance. We felt fortunate indeed to be able to find and show many of the Mothapaloozians this wonderful larva. It is the state endangered Unexpected Cycnia moth, Cycnia inopinata, and its caterpillars are highly cool. Not just cool - highly cool. For one, they're orange. Two, the cats are adorned with miniature forests of pencil eraser-like hair tufts. The forwardmost tufts are elongated into spectacular plumes. The animal suggests a larval Liberace, all feathered and boa'd up for a show. Conspicuous as these two caterpillars may be in this shot, when on their (seemingly) preferred host plant's flowers, they are not nearly so obvious. That's because Unexpected Cycnia caterpillars often nosh on the orange flowers of Butterfly-weed, Asclepias tuberosa, and then the cat's coloration causes them to blend well with the surroundings. Unlike the preceding Black-waved Flannel Moth, the adult Unexpected Cycnia little resembles its caterpillar. It, too, is quite beautiful, but in a completely different way than is the caterpillar. Scroll between the two, and it doesn't even seem as if they would be related. This disparity between caterpillar and moth is one of the great pleasures of studying these organisms. It's almost as if every species is made up of two species: caterpillar and moth. A group of moth'ers inspects the bounty at a light sheet deep in Shawnee State Forest, around midnight last night. The sheet was covered with myriad moths of many different species. The landmark Mothapalooza event took place over the weekend, and what an event it turned out to be! Approximately 150 moth (and nature) enthusiasts converged on Shawnee State Park in southern Ohio for an action-packed and probably unprecedented mothing event, at least in terms of size and scale. People from ten or twelve states - as far as Nebraska, Connecticut, and Florida - and Canada made the scene, and saw lots of cool stuff. When we hatched this idea last year, we had no idea so many people would be interested. But we're glad that they were, and I think that everyone had a really great time. The hours were certainly odd - the primary field trips were nocturnal, of course, and departed at 9:15 pm. Some groups did not return until 2 am or thereabouts! The Mothapalooza team deployed mothing stations far and wide, both at Shawnee State Park and forest, and at the Edge of Appalachia Preserve in neighboring Adams County. We knew the moths wouldn't let us down, and they didn't. The various light trap stations attracted blizzards of moths of scores of species, including jaw-droppers such as this Giant Leopard Moth, Hypercompe scribonia. The attendees were divvied up into groups, and shuttled to the various stations. For many, it was their first up and close encounter with bizarre, cool, and interesting species, including this Black-waved Flannel Moth, Lagoa crispata. Eight-year-old Isabella was enchanted with moths, and we had to drag her away from the sheets as midnight ticked past, and the adults grew weary. Here, she models three gorgeous species (L to R): Anna Tiger Moth, Grammia anna, the aforementioned Giant Leopard Moth, and an Io Moth, Automeris io. There were diurnal field trips too, and here Dr. David Wagner kneels to show this group some sort of interesting butterfly. This group tallied 39 species of butterflies on our four hour foray, and a lot of other biota such as rare plants, birds, and non-Lepidopteran insects. Dave Wagner was a pivotal force in the spawning of Mothapalooza. He, John Howard (second from left, in green shirt), and your narrator essentially hatched the idea while doing field work in southern Ohio last year. We needed someone smart, capable, good with people, and incredibly organized to oversee the show, and found such a person in Mary Ann Barnett, who is at the far left in the photo. She did an awesome job with scads of details and the weirdness that comes with organizing a giant moth conference. It wouldn't have happened without her! This photo says it all. One of our participants, Melissa, had never seen a real live Luna Moth, Actias luna, and it was Numero Uno on her wish list. Well, not only did she see a Luna, she got to hold one! Only minutes after this experience, we found yet another, and those two were only a small chunk of the total Luna tally. There are lots of people who deserve great thanks for helping to make Mothapalooza possible, and for contributing to its success. I want to share some more about this event and the folks who were there, but with only about eight hours of sleep over the past three days, additional Mothapalooza posts will have to wait. Thanks to everyone who came out, and we have already discussed the possibility of Mothapalooza II! Last Saturday, I put in a marathon day in one of my favorite parts of the world - southern Ohio's diverse Adams County. I got down there at 9 am, and met up with John Howard at his house, which sits in the midst of lots of GOOD STUFF. We explored far and wide that day, in part scouting things for this weekend's Mothapalooza. After dinner, John turned me on to a "life" dragonfly, the Stygian Shadowdragon, Neurocordulia yamaskanensis. These things are cool as can be, coming out to fly for a brief period from dusk until dark. We saw many of them at fingertip range hunting over Ohio Brush Creek, and if all goes well we'll have one in the hand tomorrow night, and I'll make some photos - that's about the only way you'll get a camera on one of these beasts. After the shadowdragons, we worked until nearly midnight at John's moth traps, recording many interesting things. I rolled back into my driveway around 2 am that morning. When John and I get afield, we always find scores of cool stuff, and this trip was no exception. Hopefully, you ophidiophobes have already figured out from this post's title that the feature creature is a SNAKE. If not, I am engaging in an act of courtesy, and warning you now: THIS POST IS ABOUT A SNAKE! Oh no, oh no, a snake, a snake - turn back, turn back! For those of you bold enough to venture ahead, and who may never have had the great fortune to meet a kingsnake, onward ho! I had the distinct pleasure of seeing not one, but two, Black Kingsnakes, Lampropeltis getula, on this day. John had caught one in his garden before I arrived, and I found another under a debris pile later that day. Neither were particularly large, about two feet in length, but a well-developed adult can reach four feet. Kingsnakes are normally fairly passive, and while they might try and take a nip when first captured, neither of these individuals made an attempt to bite and calmed down nicely. The kingsnake is a handsome reptile indeed: rich lustrous black, stippled with fine white lines and a checkerboard belly. Their sleek tubular shape is quite pleasing to the eye. Overall, this is a rare beast in Ohio. Populations are currently known from only four of our southernmost counties: Adams, Jackson, Lawrence, and Scioto. 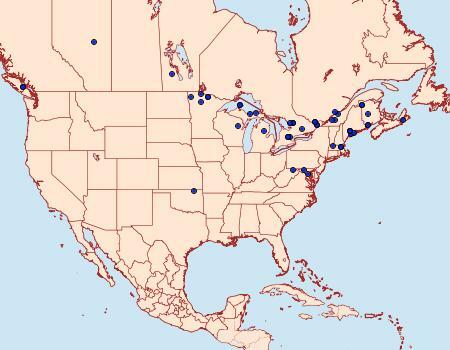 Kingsnakes can be fairly common in some regions within these counties, though. The large eye suggests an animal who takes part in the nightlife, and Black Kingsnakes do indeed prowl under cover of darkness. The one that I found this day was sleeping it off under cover, and that's often how one finds them. When they do emerge and go on the hunt, lesser creatures would do well to stay out of the snake's path. Small mammals such as mice and voles are fair game, as are songbirds, fence lizards and skinks, and probably large insects and other invertebrates. But why the name "Kingsnake"? Because, docile and handsome as this reptile may be, they pursue other snakes with a vengeance, and any other snake small enough to be swallowed is not safe if a kingsnake is afoot. Kingsnakes probably take plenty of other harmless species such as Eastern Garter Snakes, Brown Snakes, Ring-necked Snakes and the like. But even the venomous species are not immune, and in this part of the world that would be the Timber Rattlesnake and Northern Copperhead. While even the biggest kingsnake isn't going to handle a full-grown Timber Rattlesnake, they'll catch and eat the small ones, apparently. Kingsnakes are unaffected by venom, and thus able to handle rattlesnakes and copperheads, both of which most other predators give a wide berth. Any snake that can catch and eat a Timber Rattlesnake deserves to be dubbed the king. Ohio's most stunning orchid has arisen!